2’3’-cGAMP (cyclic [G(2’,5’)pA(3’,5’)p]) is produced in mammalian cells by cGAS (cGAMP synthase) in response to double-stranded DNA in the cytoplasm. 2’3’-cGAMP is also referred to as “noncanonical“ cGAMP due to the presence of the atypical 2’-5’ phosphodiester linkage between the guanosine and the adenosine. Similar to the canonical 3’3’-cGAMP, 2’3’-cGAMP serves as a second messenger to activate innate immune responses by binding to STING (stimulator of IFN genes) and subsequently inducing the TBK1-IRF3-dependent production of IFN-β . 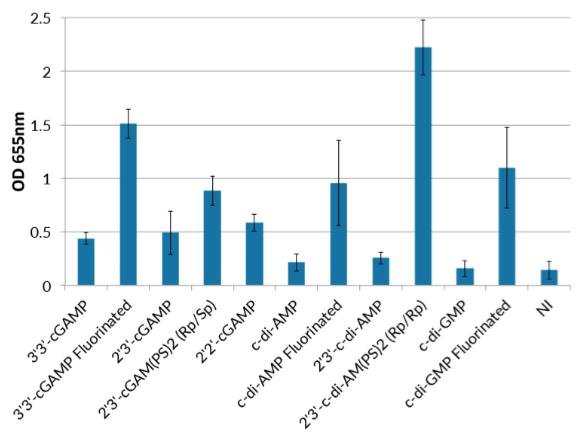 Structural and functional studies revealed that noncanonical 2’3’-cGAMP is distinct from the canonical 3’3’-cGAMP produced by bacteria [2,3]. 2'3'-cGAMP binds to STING with a much greater affinity than 3'3'-cGAMP . Certain variants of STING are able to distinguish between noncanonical and canonical cGAMP . 1. Zhang X. et al., 2013. Cyclic GMP-AMP containing mixed phosphdiester linkages is an endogenous high-affinity ligand for STING. Mol Cell.51(2):226-35. 2. Diner E. et al., 2013. The Innate Immune DNA Sensor cGAS Produces a Noncanonical Cyclic Dinucleotide that Activates Human STING. Cell Rep. 3(5):1355-61. 3. Gao P. et al., 2013. Cyclic [G(2',5')pA(3',5')p] is the metazoan second messenger produced by DNA-activated cyclic GMP-AMP synthase. Cell. 153(5):1094-107. THP1-Dual™ cells were stimulated for 24 hours with the STING ligands as shown (all at 10 μg/ml). 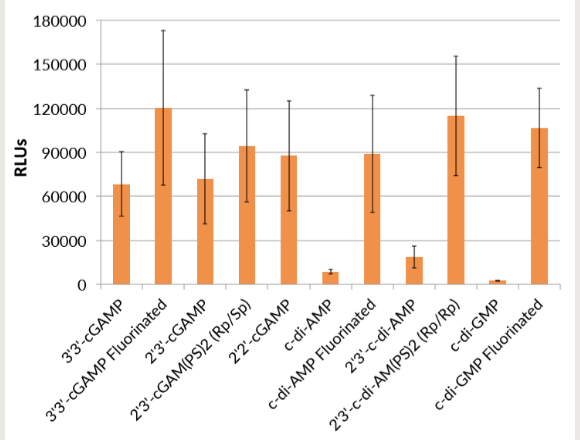 IRF induction was determined by measuring the relative light units (RLUs) in a luminometer using QUANTI‑Luc™, a Lucia luciferase detection reagent. THP1-Dual™ cells were stimulated for 24 hours with the STING ligands as shown (all at 10 μg/ml). NF‑kB induction was determined using QUANTI‑Blue™, a SEAP detection reagent, and by reading the optical density (OD) at 655 nm. Non-induced cells (NI) have been included as a negative control. The biological activity is assessed by measuring induction of the interferon pathway in THP1-Blue™ ISG cells. The absence of endotoxins and other bacterial contaminants has been confirmed using HEK-Blue™ TLR4 and HEK-Blue™ TLR2 cells. 2’3’-cGAMP is provided as a lyophilized powder, product is sterile filtered prior to lyophilization. 200 µg 2’3’-cGAMP + 1.5 ml endotoxin-free water. 500 µg 2’3’-cGAMP + 1.5 ml endotoxin-free water. 1 mg (2 x 500 µg) 2’3’-cGAMP + 1.5 ml endotoxin-free water. 5 mg (5 x 1 mg) 2’3’-cGAMP + 1.5 ml endotoxin-free water. 2’3’-cGAMP should be stored at -20°C. Acetylation Blocks cGAS Activity and Inhibits Self-DNA-Induced Autoimmunity. The Ca2+ sensor STIM1 regulates the type I interferon response by retaining the signaling adaptor STING at the endoplasmic reticulum. Endosomolytic polymersomes increase the activity of cyclic dinucleotide STING agonists to enhance cancer immunotherapy. IL-15 is a component of the inflammatory milieu in the tumor microenvironment promoting antitumor responses. Santana Carrero R.M. et al. 2018 Nucleic Acids Res. 46(8):4054-4071. A novel transcript isoform of STING that sequesters cGAMP and dominantly inhibits innate nucleic acid sensing. Multiple Homozygous Variants in the STING-Encoding TMEM173 Gene in HIV Long-Term Nonprogressors. 2018 Cell Host Microbe. 23(3):297-301. Dampened STING-Dependent Interferon Activation in Bats. STING agonists enable antiviral cross-talk between human cells and confer protection against genital herpes in mice. Mitotic progression following DNA damage enables pattern recognition within micronuclei. IFI16 and cGAS cooperate in the activation of STING during DNA sensing in human keratinocytes. Dengue virus activates cGAS through the release of mitochondrial DNA. Ku70 Senses HTLV-1 DNA and Modulates HTLV-1 Replication. Agonist-Mediated Activation of STING Induces Apoptosis in Malignant B Cells. LSm14A Plays a Critical Role in Antiviral Immune Responses by Regulating MITA Level in a Cell-Specific Manner. 2016 Eur J Immunol. 46(7):1615-21. Human plasmacytoid dentritic cells elicit a Type I Interferon response by sensing DNA via the GAS-STING signaling pathway. Bode C, Fox M, Tewary P, Steinhagen A, Ellerkmann RK, Klinman D, Baumgarten G, Hornung V, Steinhagen F.
Cutting Edge: Novel Tmem173 Allele Reveals Importance of STING N Terminus in Trafficking and Type I IFN Production. Surpris G, Chan J, Thompson M, Ilyukha V, Liu BC, Atianand M, Sharma S, Volkova T, Smirnova I, Fitzgerald KA, Poltorak A.
Activation of STING requires palmitoylation at the Golgi. DMXAA causes tumor site-specific vascular disruption in murine non-small cell lung cancer, and like the endogenous non-canonical cyclic dinucleotide STING agonist, 2'3'-cGAMP, induces M2 macrophage repolarization. MAVS, cGAS, and endogenous retroviruses in T-independent B cell responses. Inherited STING-activating mutation underlies a familial inflammatory syndrome with lupus-like manifestations. Jeremiah N, Neven B, Gentili M, Callebaut I, Maschalidi S, Stolzenberg MC, Goudin N, Frémond ML, Nitschke P, Molina TJ, Blanche S, Picard C, Rice GI, Crow YJ, Manel N, Fischer A, Bader-Meunier B, Rieux-Laucat F.
The DNA Sensor, Cyclic GMP-AMP Synthase, Is Essential for Induction of IFN-β during Chlamydia trachomatis Infection. Cyclic dinucleotides trigger ULK1 (ATG1) phosphorylation of STING to prevent sustained innate immune signaling.